Sleek Makeup has released their Lash Out Mascara, pitched as both a volumizing and lengthening mascara with an innovative brush to give you lush, long lashes. What, a new mascara? You know I'm all over it like white on rice! 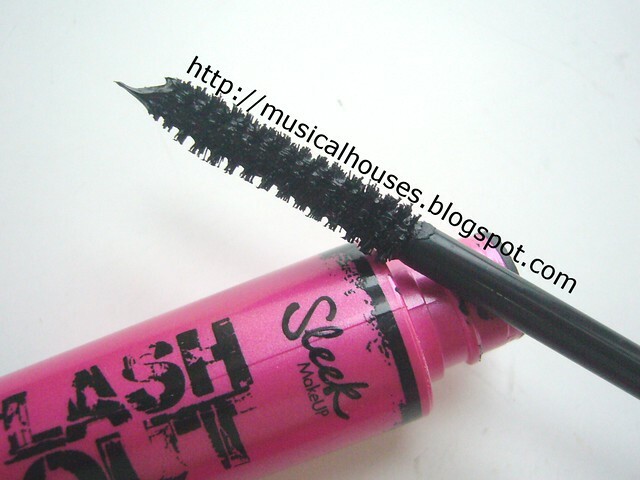 The Lash Out Mascara comes in a long, pink tube, with black print. It also comes in a pink and black box. Pink and black? Me likey. The mascara wand on the Lash Out Mascara is pretty small. I'm used to big brushy wands, so to me, the size of the wand doesn't really matter (ha, ha, I know what you're thinking at this point. I'm talking about mascara here! :P). Some of the mascaras that have worked better for me, in fact, have hugeass wands, so I think I've pretty much mastered the art of using a big wand on my tiny, puny Asian eye and lashes. It's a skill, you know. Still, I appreciate a small wand that allows me to rotate, move, and maneuver the wand. The wand has tight, short nylon bristles. So anyway, where was I? Oh yes, my lashes. They're short, sparse, pointing down, and just generally wimpy. Here's a photo of my lashes with no product on at all, from not one but three angles, so you can see what I'm talking about. As you can see, the Lash Out Mascara is alright on me, but not all that fantastic. I appreciated that it did lengthen my lashes and gave them more definition and volume. Overall, it seemed decent, but it wasn't really anywhere near the effect I had seen and read about on other blogs. To be honest, I felt a little underwhelmed, since almost every single review I've read on the Lash Out Mascara (except mine) has been overwhelmingly positive, and some reviews had really awesome "after" photos. I guess I'm just the odd man out when it comes to mascaras. And as I've said this in my previous mascara review/rant, most mascaras don't work on me. Only 2 or 3 mascaras out of the many I've tried have made me happy, and it's not even the "Wow this is GREAT!" type of happy, just the "this seems to be the best I can find for now" kind of happy. This makes me kind of sad, because I don't ever think I'll find the perfect mascara. But based on my experiences, my take is that this mascara would give you good length, a good amount of volume, and some ability to hold a curl. I HATE ALL SLEEK AND RIMMEL MASCARAS, PERIOD! Useless on Asian lashes. I'm not a fan of this mascara from all the reviews. It is just too clumpy.